Sen. John McCain, who made human rights and Israel centerpieces of his advocacy for a robust US influence across the planet, has died. The Arizona Republican, who on Friday declined further treatment for brain cancer, died Saturday. He was 81. Never-Trump Republicans and not a few Democrats during the campaign and presidency of Donald Trump have held up McCain as an avatar of what the Republican party once was, and still could be: the national security flagship ready to overcome partisan differences to advance US interests. Indeed, the relationship that was perhaps most emblematic of his dedication to national security and to bipartisanship was his close friendship with Joseph Lieberman, the Orthodox Jewish senator from Connecticut. McCain became in his final years the reluctant unTrump; he was the hero who spent 1967-1973 in a Vietnamese jail for American POWs, when Donald Trump was a swinging young businessman who won five deferments from service; McCain was the victim of torture who led advocacy against the practice, while Trump embraced it; McCain was the flag-bearer for robust American interventionism abroad, while Trump counsels conciliation and isolationism; McCain was candid about his flaws while Trump seldom apologizes; McCain took long meetings and delved into detail, while Trump eschews particulars for the big picture; McCain forgave his enemies while Trump nurtures his enmities. Prime Minister Benjamin Netanyahu and Israeli politicians on Sunday hailed US Sen. John McCain for his principled leadership and stalwart support of the Jewish state, following his death on Saturday. McCain, a war hero and towering figure in American politics known for reaching across the aisle in an increasingly divided nation, passed away Saturday following a battle with brain cancer. He was 81. Former prime minister Ehud Barak said that McCain, a longtime personal friend, was among the few principled political leaders today. A few months after the 2008 elections, I happened to be in Washington and sought out my old friend senator John McCain. I hoped to express my support in the face of his defeat in those elections, and my confidence that his legacy wouldn’t be defined by it. I was taken to a small chamber in the Senate to await McCain, who was embroiled in a legislative battle on the floor and didn’t want to leave the building. The “we” senator McCain spoke of, and the affinity he alluded to, was formed in our very first meeting, when I visited the US shortly after my release from the Soviet gulag in 1986. “I understand why you refused to be released on the USSR’s terms two years ago,” he told me then, referring to a deal I rejected, to the shock and consternation of many western supporters. Many couldn’t understand why I refused to request an early release from prison for health reasons. After all, the Soviet authorities had secretly promised their American counterparts that they would grant such a request. McCain, who experienced the horrors of captivity and dictatorship first hand, understood what they couldn’t. The accolades are by now familiar. Patriot, war hero, maverick, devoted father and husband, a man of unswerving principles and a staunch defender of Israel. I can only add one more: John McCain was my friend. That friendship began in 2008, when I was on sabbatical in the United States. I was invited to a dinner held in John’s honor outside of New York. He was then in the thick of his presidential campaign, running 20-hour days. And yet, when it came time to leave, he offered me a lift into the city, and rather than sleeping, spent the entire trip asking me about Israel. What had motivated me to move there, he wanted to know, and what was it like raising an Israeli family and serving in the IDF? And he kept asking me right up to the time he dropped me off at home. I had other occasions to meet John after that – at an award ceremony for his hero, Nathan Sharansky – but not until my appointment as ambassador in 2009 did I have the honor of working with him. And on every issue impacting Israel – missile defense, the peace process, Iran – John was passionate. These were the Obama years, a challenging time in US-Israel relations, and John was tireless in assuring that the Senate, in particular, and Congress, in general, always stood firmly with Israel. Together with senators Lindsey Graham and Joseph Lieberman – the “three amigos” – John preserved the bipartisan support so vital to Israel’s security. It would be difficult to overstate the debt that all Israelis owe to John and our profoundest gratitude. But in addition to pressing diplomatic and defense matters, most memorable were the hours he spent with me, my family and friends, chatting in his office, listening to his harrowing war stories. The most extraordinary event, though, was a retirement banquet at the Israel Embassy for Joe Lieberman. 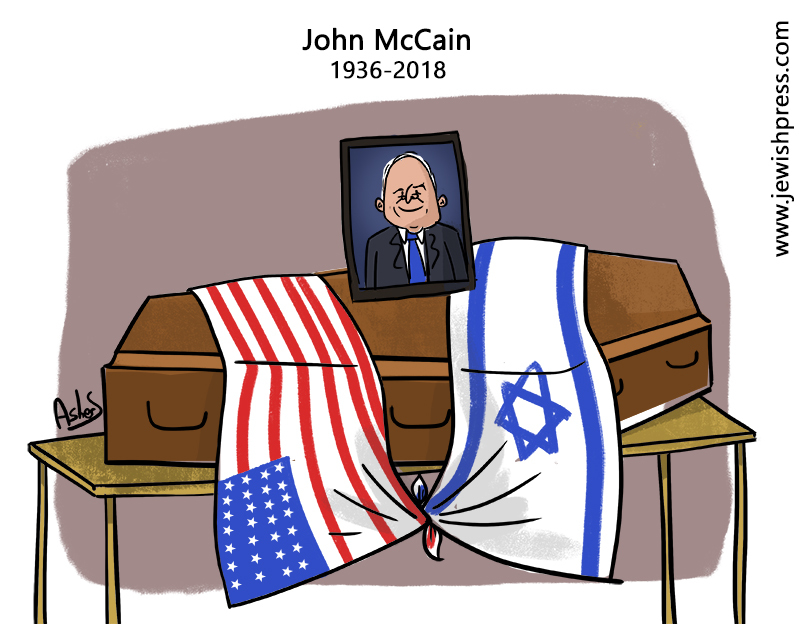 Justice Minister Ayelet Shaked eulogized the late US senator John McCain on social media writing that "he was a true patriot and a true friend of Israel." McCain passed away on Saturday from glioblastoma, an aggressive form of brain cancer, at the age of 81. Shaked lauded the veteran US Navy pilot for his refusal of an offer from the Vietcong to release him in 1968 when his father, John S. McCain Jr, was named commander of all U.S. forces in Vietnam. "He refused to be liberated from his captivity before other soldiers were released," Shaked wrote. McCain was captured in October 1967 when his A-4E Skyhawk was shot down by a missile over Hanoi. He was a prisoner of war until his release in 1973. "He knew the challenges [facing] the state of Israel," Shaked wrote, "during his 36 years of service...the governments of Israel knew they had a friend. May his memory be a blessing." Defense Minister Avigdor Liberman also wrote on social media a personal story about the late US Senator. "During one of our last meetings in Washington D.C.," wrote Liberman, "he showed me a photograph taken when he was in captivity and said: "Despite the terrible suffering, I never doubted my commitment to the values of freedom and justice." The Trump administration’s decision to cut more than $200 million in aid to the Palestinians has drawn praise from a top Israeli government official and criticism from a former US ambassador to the Jewish state. “We have undertaken a review of US assistance to the Palestinian Authority and in the West Bank and Gaza to ensure these funds are spent in accordance with US national interests and provide value to the US taxpayer,” the official said in a statement. This latest development came amid the Palestinian Authority’s ongoing boycott of the Trump administration, which has been trying to revive the long-dormant Israeli-Palestinian peace process. An Israeli minister on Sunday praised US President Donald Trump’s administration for reportedly planning to announce shortly that it rejects the Palestinian demand of a “right of return” to Israel for refugees and their descendants, and said Jerusalem would support such a declaration. “An American cancellation of the recognition of the fictitious ‘right’ of return and of the fictitious refugee-by-descent status would be a courageous and just step that uncovers layers of lies,” Naftali Bennett, leader of the right-wing Jewish Home party and a member of the high-level security cabinet, said in a statement. Israel rejects the demand, saying that it represents a bid by the Palestinians to destroy Israel by weight of numbers. Israel’s population is almost nine million, some three-quarters of whom are Jewish. 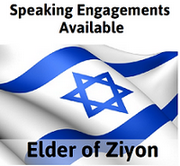 An influx of millions would mean Israel would no longer be a Jewish-majority state. Should America Stop Funding UNRWA? UNRWA provides aid to Palestinians. But it does some harmful things too: slandering Jews and putting Israeli lives in danger. It even worsens the refugee problem. Trump wants to cut funding. So why is the Israeli PM urging him to reconsider? The answers might surprise you. The new policy is slated to include a series of measures, including the publication of a report which puts the total number of Palestinian refugees at approximately 500,000, the TV report said. According to the United Nations Relief and Works Agency, a UN body that provides Palestinian refugees with education, health, social welfare and other services, there are 5.3 million Palestinian refugees. In sharp contrast to the definition of a refugee set out by the UN High Commissioner for Refugees, the UNRWA tally uniquely counts the millions of descendants of Palestinian refugees, including those who have citizenship in other countries, a policy that has drawn fierce criticism from Israel. In peace talks, the Palestinian leadership has always publicly demanded a “right of return” to Israel for these millions. Israel has long rejected the return of Palestinian refugees and their descendants to their former and ancestral homes in Israel, arguing that such a move would spell the end of the country as a Jewish-majority state. Yousuf al-Mahmoud, the official spokesman of the PA, confirmed that the American administration has not met its financial "commitment" to the Palestinian Authority for more than a year, and therefore there is nothing new in the American announcement of a cut in millions of dollars in aid to the PA that was recently published on the matter. Mahmoud added that the American announcement of the cessation of aid was part of the policy of “blackmail” and pressure exerted by President Donald Trump against PA leadership in an attempt to force it to accept the “Deal of the Century,” the American peace initiative to resolve the conflict. He said that the current US policy supports the "Israeli occupation" and undermines any possibility of peace. Head of the Har Hevron Regional Council calls on the IDF and police to issue orders against leftists who broke into town of Mitzpe Yair. Yochai Dimri, head of the Har Hevron Regional Council, responded on Saturday night to the incident in which leftist activists from the Ta’ayush organization broke into the Jewish town of Mitzpe Yair during Shabbat. The four activists claimed that they were in the area to take photographs and that they were attacked by local residents while doing so. They were lightly injured and transferred to a local hospital. "After the activists of the anarchist Ta’ayush organization supported illegal Arab construction on state lands, they chose to disrupt the Shabbat quiet of the residents of Mitzpe Yair, entering private homes, photographing them and violating a closed military zone order in order to create a provocation. Any healthy person who experiences a break-in to his home would act to protect his home and his family and remove the invading criminals," said Dimri. "The leftist activists, when they understood that they were about to be arrested, asked to be evacuated to the hospital, but from an examination we conducted in the hospital, they were simply putting on a show meant to produce headlines. 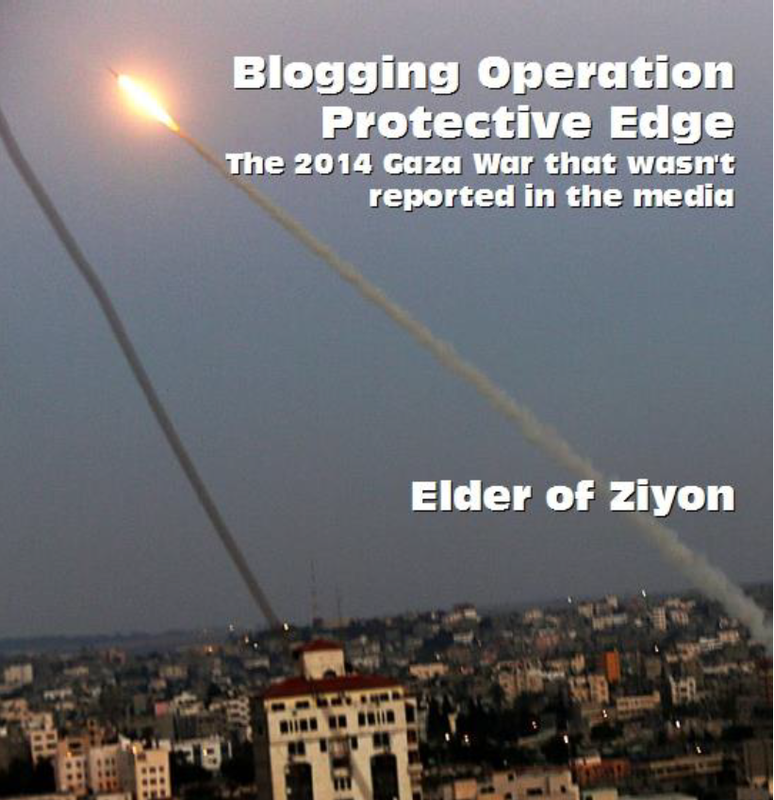 We again call upon the IDF and the police to issue restraining orders against the group. Their presence causes violations of the law and harms our communities. Every community they come to later suffers from burglaries and thefts and massive illegal construction by Arabs. The time has come to put an end to this, once and for all,” he added. MK Bezalel Smotrich (Jewish Home) commented on the provocation as well and added, "Violent provocateurs who leave their home every Shabbat and travel many kilometers to encourage and cooperate with Arab rioters and trespassers who harm the settlement enterprise by using violence and endangering the lives of the residents. It is reasonable to assume that they were injured in the course of their own violence and that they are making up stories about the local residents, who at worst had to protect themselves from the rioters and invaders." Dr. Martin Sherman discusses what will be if and when PA chief Abbas is no longer in control. Israel will only agree to engage in indirect negotiations with Hamas about easing the humanitarian situation in the Gaza Strip only when attacks on southern Israel, particularly the areas adjacent to Gaza, stop completely and calm is fully restored, a senior official traveling with Prime Minister Benjamin Netanyahu in Lithuania said this weekend. The official spoke following protests on the Gaza border on Friday and recent reports of an imminent cease-fire deal between Israel and Hamas. "There is no deal yet," the official said. "Everyone is working together in a coordinated fashion. 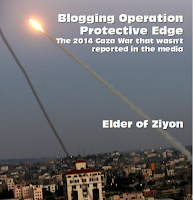 Yes, we are working to secure a cease-fire." The official said further that Israel would be willing, in principle, to increase the electricity supply to Gaza if Qatar were to fund it, and that it would also be willing to transfer Qatari-funded salaries to Palestinian Authority employees in the Gaza Strip. Another possibility the official mentioned was talks over a potential maritime supply route between Cyprus and Gaza. However, the official explained, all these gestures would be entirely contingent on a complete cease-fire along the border, similar to the calm following the 2014 Operation Protective Edge. Hamas denied on Saturday that Israel had offered it an airport near Eilat as part of a long-term truce agreement between the two sides. The denial came in response to claims by Mahmoud al-Aloul, deputy head of the Palestinian ruling Fatah faction, who was quoted last Thursday as saying that Israel had offered Hamas an airport near Eilat. The Hamas official was referring to the airport which the Palestinians opened in the southern Gaza Strip in 1998, and which is named after former PLO leader Yasser Arafat. The airport ceased operation in October 2001, after Israel bombed its radar station and control tower, and cut the runway apart in response to terror attacks waged by the Palestinians during the Second Intifada. Hardly a day goes by without another shocking revelation of Jeremy Corbyn’s association with antisemites. But while most of us recoil at Corbyn’s documented support for his “friends” Hamas and Hezbollah, his appearances on the Iranian-funded Press TV, and his tribute to the perpetrators of the Munich massacre, little has been said about the intellectual underpinnings of the ideological world-view that Corbyn has clung to for 40 years. It is time that they were debunked from a Sephardi or Mizrahi perspective. I doubt whether Corbyn has heard of Mizrachi or Sephardi Jews. Did he know that 850,000 Jewish refugees fled Arab and Muslim antisemitism in a single generation? Would it appall him that ancient communities once numbering many thousands of Jews — from Morocco in the West to Yemen in the East — were driven to extinction (barely 4,500 are left), their property stolen and their rich heritage erased? Maybe he will blame the Zionists — or say that the Jews left of their own free will. The evidence of a forced Jewish exodus is incontrovertible, however. The Jews fled in larger numbers than the Palestinians from Israel. The majority of Jews were escaping harassment, intimidation, violence and persecution — ranging from arrests and imprisonment to execution on trumped-up charges. Theirs was the largest mass movement of non-Muslims until the post-2003 flight of Christians from Iraq. Clearly, Corbyn’s revulsion for the state of Israel lies at the heart of his belief system. Many believe he has been reluctant to accept the International Holocaust Remembrance Alliance definition of antisemitism so that he might continue to call the Jewish state “racist”and allow offensive comparisons between Zionists and Nazis. He insists on distinguishing between “good” anti-Zionist Jews and “bad” Jews — the great majority of whom identify with Israel. Yet the bitter experiences of Middle Eastern and North African Jews teach us that the distinction between Jews and Zionists cannot be maintained for long. Jewish delegates to the upcoming British Labour Party conference will be given bodyguards over fears for their safety from supporters of party leader Jeremy Corbyn. The protection also will be offered to Jewish Labour Party lawmakers, the Daily Mail reported late Saturday. The newspaper reported that the Jewish Labour Movement has held talks with the Community Security Trust, which oversees security for the Jewish community in Britain, about providing security for next month’s conference, which will be held in Liverpool. Jewish Labour lawmaker Luciana Berger, who serves as parliamentary chair for the Jewish Labour Movement, on Saturday slammed Corbyn for statements he made in 2013 that surfaced last week on video, in which he said that “Zionists” were unable to understand British ways of thinking despite growing up in the country. Look. Some of my best friends are Jews. Or were, before all of this. Some of my best friends are also members of Hamas and Hezbollah, I have a lot of friends, ok? Since when is having lots of friends a crime? I have always stood up for the Jews and any victims of bigotry. In the Labour Party there is no place for it, not anti-Semitism, anti-terrorism, or any of the other anti-isms. By changing the definition of anti-Semitism, I have reduced the number of cases of anti-Semitism in the Labour Party that can be considered anti-Semitic by 98%. So it cannot be said that I am not making serious efforts to clamp down on the Jewish problem. But after everything I’ve ever done for the Jews – all the times I’ve been forced to come out and say that they’re not all bad; and that anti-Semitism, when people find out about it, is bad; and that it’s a shame the Holocaust happened, but at least the Jews can learn some lessons from it – despite all of that, they’ve turned against me. Palij’s excuses, of course, have been heard hundreds of times from other Nazi collaborators in Europe, who say that their complicity in the murder of Jews was the price of staying alive under Nazi occupation. More recently, that has been accompanied by a tendency among governments in the region — with the Baltic states of Lithuania, Latvia, and Estonia among the worst offenders in this regard — to publicly honor certain Nazi collaborators on the grounds that they were also heroic anti-Soviet resistance fighters. Through this revision of history, the murder of six million Jews becomes just one of many examples of inhumanity during the Second World War, rather than the driving obsession and ultimate goal of the Nazi regime. In Germany, where Palij will see out his remaining days, he will be treated humanely, and given all the attention that a person his age requires to maintain their comfort and dignity. That, most probably, will be the last lesson this monster receives in the merits of the civilization that he fought in the name of barbarism.